Mangrove cover across Raigad, Ratnagiri and Sindhudurg districts witnessed a 30% net increase this year but a 4% decline was recorded in districts of Palghar and Thane in the Mumbai Metropolitan Region. Raigad recorded a 33% rise with highest increase across all districts at 35 sq. km. This takes its mangrove cover tally to 141.21 sq. km as compared to the India State of Forest Report 2017 that recorded 106 sq.km. 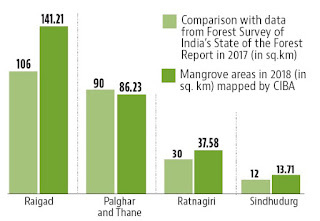 The increase was revealed in a 2018 assessment of mangrove cover across coastal districts of Maharashtra by the Central Institute of Brackishwater Aquaculture under the Indian Council of Agricultural Research submitted to the state mangrove cell last week. Mangrove cover in Mumbai city and suburban areas was not studied. The mangrove cell said focus on livelihood activities helped boost mangrove cover across three districts and human activities led to decline in remaining districts. Environmentalists had mixed views about the report.